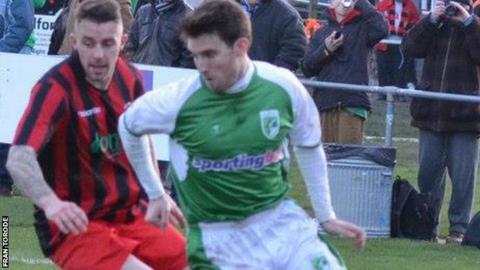 Guernsey FC have progressed to the quarter-finals of the FA Vase after a 3-1 win at Spalding United. The home side went ahead after 16 minutes before top scorer Ross Allen, who was doubtful with illness, equalised two minutes from half-time. Matt Loaring put Guernsey ahead before Allen took his tally for the season to 31 with his second to seal victory. "We showed character, got ourselves back in it, and we thoroughly deserved to win," said captain Sam Cochrane. "We've had a difficult period - we've not played a lot of football and it's been very frustrating. "We've had a two-week break so it's been hard to build momentum and get performances," Cochrane added to BBC Guernsey. Guernsey had played just three games in the two months leading up the fixture due to bad weather, but assistant manager Colin Fallaize felt his side were always capable of being ready for the game. "Once we got rid of the occasion and started to play the game we got the right side of what we deserved," he said. "We've got Island Games history, where we've had lots of preparation time because it's in the summer and we have a system and a pattern of intensity in training which helps us when we do have these unfortunate gaps in football."